Detail of a larger photograph. Seated in the middle of the "Old Faithful's" is Captain Fillingham. With many thanks to John Sheen, from his personal collection. George Sidney Fillingham served with the Royal Flying Corps, as a second lieutenant, before he transferred to the Durham Light Infanty (DLI). 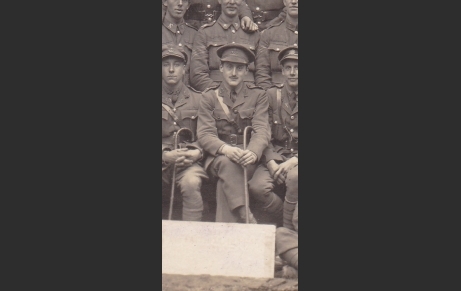 According the the Army Lists, he was serving with 12th DLI in July 1916 and 11th DLI in November of that year. Promoted to captain with DLI, Fillingham was wounded at Monchies at the start of the German Offensive, 21 March 1918.